* Fully climate controlled brand new 2017 Sprinter/Van used in this tour. 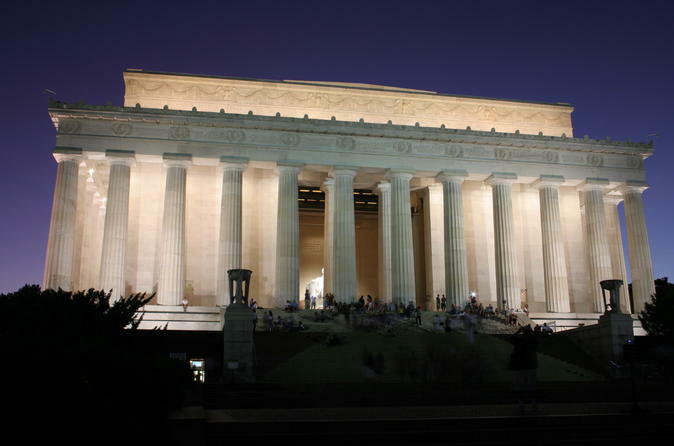 * Comprehensive Three Hours Moonlight Tour of Washington DC which covers all the memorials & historical sites. * National Archives, U.S Capitol Building, Smithsonian Museums, Washington Monument, WWII, Jefferson, FDR, MLK & Lincoln Memorials. * Personlized small group, maximum 14 passengers only in a tour. * Plenty of time to take photo and discover the memorials & sites. * Tour starts at 7:30 PM at National Archives Building (700 Pennsylvania Ave NW, DC) & it ends at the same place. * Drive by Arlington Cemetery, The Pentagon, Airforce Memorial and the Iwo Jima Memorials. * 2017 Model 14 Passenger Sprinter Van is used for the tour. * Fully climate controlled luxury Sprinter Van. * Tour conducted by a licensed, local tour guide. * Free hotel pick up & drop off from Downtown Washington, DC. * No pets allowed except a seeing eye dog. * Comfortable walking shoes recommended to discover the memorials & sites. * No meals, it is recommended to have a snack handy.